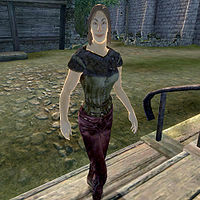 Ranaline is an Altmer commoner who cooks at the Lonely Suitor Lodge. She is a real loner who avoids talking to anyone, so it is no surprise (or disappointment) when she reveals herself as a Mythic Dawn sleeper agent and attacks you after you complete the Dagon Shrine quest. Every morning, after waking up at 6am, she will spend two hours within her house before leaving for work. At the Lonely Suitor Lodge, she will work a full 12 hours before finally eating her dinner at 8pm. She exits the Lodge at 10pm and takes a late evening stroll near the northern gate before heading back to her home at midnight. Once there, she will wander around for two hours before finally going to bed at 2am. She wears a pair of laced leather pants, oiled linen shoes and an olive vest. She carries around her house key and small amount of gold. Like most of the Mythic Dawn agents, she also carries around a clue to her real identity, in this case a copy of the Conjuration skill book Mythic Dawn Commentaries 1. In combat, she casts the standard Mythic Dawn Bound Mace and Armor power. When you approach her for the first time, she will introduce herself briefly: "Ranaline. I cook at the Lonely Suitor." When you question her about Bravil, she will reveal herself as a loner: "Excuse me. I stay to myself. I have always found the wrong sort of friends. Now I do without."